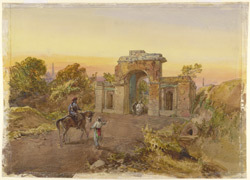 Watercolour of The Baillie Guard Gate at Lucknow in Uttar Pradesh dated circa 1861. The drawing is inscribed on the front in ink: 'Bailey Guard Gate. Lucknow. Wm. Simpson.' Lucknow, situated on the river Gumti in Uttar Pradesh, was ruled by the Nawabs of Oudh (Avadh). Lord Dalhousie's annexation of Avadh in 1856 and the exile of the last Nawab, Wajid Ali Shah, caused great resentment and Lucknow became the scene of a major struggle during the uprising of 1857. The Baillie Guard Gate was the main entrance to the Residency, which was the focus of the fiercest fighting. Although eventually destroyed, its ruins remained a testament to the tenacity of the British, with a deep resonance in the annals of the British Empire in India.